The cyclone-anticyclone asymmetry occurring in rotating turbulence is investigated through the analysis of the alignment statistics between vorticity and the rotation vector. 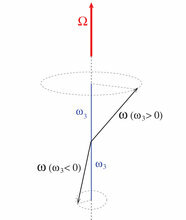 The advantage of this approach, as compared to the usual measurement of the vertical vorticity skewness, is that the symmetry-breaking can be thus quantified through the analysis of first- and second-order moments, whose statistics convergence is more easily achieved than that of third-order ones. The vorticity/rotation alignment statistics are investigated by direct numerical simulation, both in forced and in freely decaying homogeneous turbulence. In the forced case, the cyclone-anticyclone asymmetry gets stronger as the Rossby number is decreased, whereas the opposite behavior occurs in the decaying case. These findings are shown to be consistent with the existence of a non-monotonic Rossby-number dependence of the asymmetry. A preferential antialignment of vorticity with the rotation vector is found in all the flows considered, a behavior supported by geometrical arguments and by a Taylor expansion of the Navier-Stokes equations for early times of rotation and in the weak rotation limit. A multiscale analysis of the alignment properties between vorticity and the rotation vector is also carried out in the forced case, evidencing the existence of a scale at which both the symmetry-breaking and the collinearity between the two vectors are maximal.